l decorated amateur in his day, with 10 National titles, a European title & a trip to the 1996 Olympic games, all before his twentieth birthday. 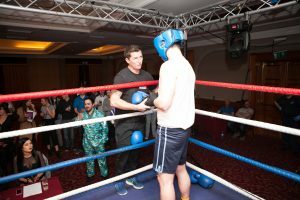 Cathal was making waves as a professional boxer before his promising career was cut short due to a medical complication. Since retiring, he has worked as a coach to the National High Performance Boxing Team, before setting up White Collar Boxing in 2005. Cathal loves teaching boxing, particularly the more traditional components of boxing, such as the heavy bag, jumping rope & speed ball. Temo is a former Top 5 world ranked amateur boxer. He represented his country, Georgia, at the 2000 Sydney Olympic Games. Technically, Temo is one of the best coaches out there. Along with his vast experience & expertise, he brings great energy & fun to his classes. Temo truly is the master of his trade. Ireland has been home to Temo since 2008. 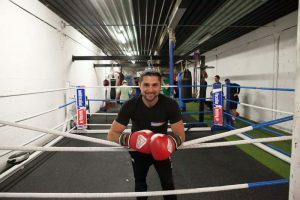 Temo loves working and training in Ireland and particularly enjoys teaching adults how to box. If you want to get fighting fit, be sure to get in for a class with the legend that is, Temo. Des Earls is our resident Strength & Conditioning coach. Des is highly qualified & experienced in his area. He holds a Masters in Strength & Conditioning. He delivers top quality classes with a constant focus on correct technique & safety. He is the master of tailoring a class to meet each individual’s needs. He is a former International Middle Distance Runner, who has been coaching at every level from beginner to elite athletes for many years. Des is one of the most knowledgeable coaches out there. If you want results, Des is your Man. Coach Richie Connell, is an ABA certified coach. He understands what it is like to start boxing at a later stage, having first laced on the gloves at 29 years of age. Since then he has become a tireless student of the game. He has competed in the nationals, only to be narrowly beaten in the final. His passion and understanding of the sport won’t be matched, he really is one of a kind and a great guy to have in your corner. 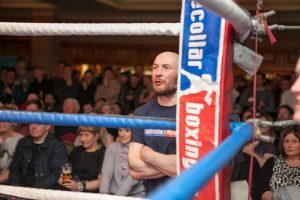 Boxing plays a major part in Mark’s life, from following the sport as a fan, to competing in amateur boxing, to coaching. It has been a positive influence, encouraging him to lead a much healthier lifestyle, both in and out of the ring. Having spent many years competing out of St Saviours Amateur Boxing Club, Dublin, Mark then moved to Liverpool to attend University. Here, he founded the LJMU Boxing club, where he acted as both president & coach, giving students the opportunity to benefit from the sport. Following this he moved to Dubai, where he spent over 4 years working in the fitness industry, as a personal trainer and boxing coach. In the months before returning to Ireland he was selected to be one of the head boxing coaches for the reality TV series: “Fighting Fit Dubai”. Since his return to Ireland, Mark continues to work as a boxing coach, passing on his vast experience & knowledge of “the sweet science”.